Mary Rouse Bowen, 95, of Dudley, went to be with her Lord and Savior Thursday, March 21, 2019 at Kitty Askins Hospice Center in Goldsboro. The family will receive friends Sunday, March 24, 2019 from 3 until 4 p.m. at May’s Chapel Free Will Baptist Church Family Life Center. A graveside service will follow in the church cemetery. Mrs. Bowen was born in Greene County on March 31, 1923 to the late Paul G. “Doc” Rouse and Effie Dail Rouse. She was a faithful member of May’s Chapel Free Will Baptist Church and NTO Club which she attended as long as she was able. Mrs. Bowen worked hard on the farm in Wayne County alongside her husband while raising their sons. 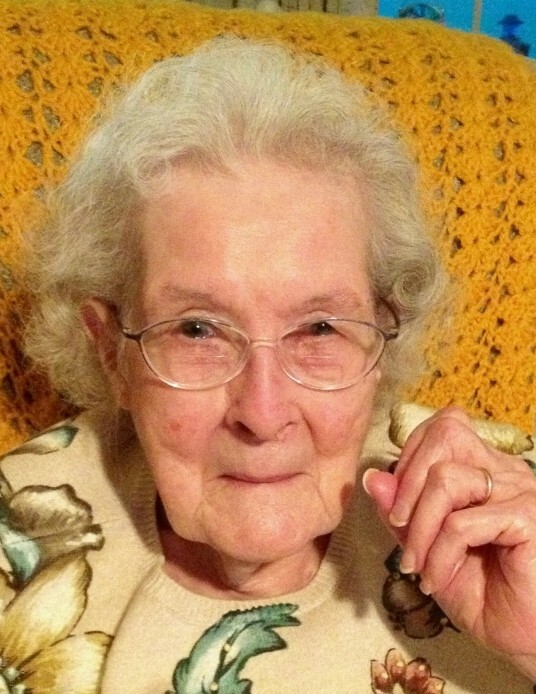 She enjoyed decorating cakes, crocheting, especially baby shoes, watching tv, and reading our Daily Bread books. She is survived by three sons, Jimmy Elton Bowen and wife, Lois of Garner, Thomas Rodney Bowen and wife, Lynora of Florida and Edwin Lee Bowen of Cary; five grandchildren, Michael Bowen (Chelsea), Allen Bowen (Jennifer), Richard Bowen (Michelle), Ryan Bowen (Melissa) and Joshua Bowen (Caitlin) and nine great-grandchildren, Emma, Karah, Jonah, Luke, Josiah, Michael Lee, Caroline, Benjamin and Mary Alice. In addition to her parents, Mrs. Bowen was preceded in death by her husband of 65 years, Thad Allen “T.A.” Bowen; two brothers, Frank L. Rouse and Benjamin Rouse and two sisters, Ruby Rouse Smith and Lucille Rouse Carrow. A special thanks to her niece and nephew, Terri and Charles Gardner, and the other many loving people who provided care for her. In lieu of flowers, memorial contributions may be directed to May’s Chapel Free Will Baptist Church, c/o Barbara Lancaster, 118 Ridgecrest Drive, Mount Olive, NC 28365.